One of the most annoying things when you’re a Windows gamer is when you have your screen resolution change, and then the game crashes. A lot of times, because it doesn’t restore the resolution, your desktop icons are all out of whack. No more though! DesktopOK allows you save resolution profiles, and under these profiles are the desktop icon locations. 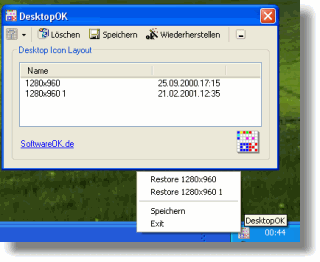 This application is freeware for Windows and doesn’t have to be installed which allows you to take it on the go and still be able to restore the look-and-feel of your screen.